I cannot stress this enough: being able to play over a jazz blues is crucial for any jazz musician. This post is more of "ready, aim, fire" type of blog post on improvising over the jazz blues form. To get started, it's important that you take the time to understand what these three exercises are all about. Each step shouldn't take more than 5-10 minutes to figure out. Once that's done, try improvising a bit using these concepts. You'll fumble around a bit, but that's all part of the process. Remember, the important thing here is consistency. Do little bits each day instead of waiting all week to cram in one afternoon. It will help solidify the information for you much more. The backing track below loops the 12-bar blues form a total of 8 times. Make sure you're aware of the form as you go through each exercise. 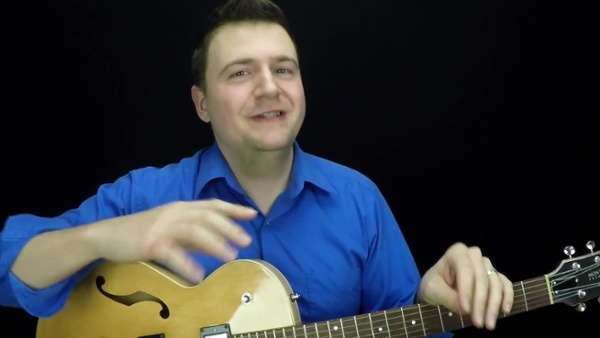 Naturally, a jazz blues can be modified in any number of interesting ways. For example, bar 4 could simply be a plain old Bb7 for one bar, but it might be more interesting to add some motion by making it Fm7-Bb7. This sets up the IV chord nicely since it's the II-V of that Eb. **Check out how we come to this version and a few others in our article on jazz blues progressions here. The same concept could be applied to that G7 in bar 8. Players often like to make it a minor II-V to the II chord by making it Dm7b5-G7b9. **More on minor II-V progressions and how to play over them here. We are adding a twist, though. This little modification will help you sound less like every rock guitar solo in the 70's and more like something Miles Davis would have actually played. Below you have both the Bb major blues and minor blues scales depicted with tablature. The Bb major pentatonic / blues scale contains the same notes as G minor pentatonic / blues. Think of that "box" with your index finger on the 3rd fret. The fingerings in the image above are somewhat diagonal. Don't fight it, just embrace it. More linear lines come out of this than your usual fretboard "boxes." Mix and match the major and the minor blues scales for Bb. Improvise using the Bb major blues scale for the first 4 bars of the 12-bar blues form. Then, use the Bb minor blues scale for the last 8 bars of the form. Once you get to bar 8, you'll want to highlight that B natural against the G7. This might seem strange considering the key here is Bb, but remember that the G7 is serving a dominant function here to get to the II chord. For a more thorough explanation on how adding the VI chord makes the form sound "jazzier," check out this YouTube video by yours truly. **Note that we're adding a Dm7b5 in front of the G7 in bar 8 as mentioned earlier. Make it a point to resolve to the 3rd of the next chord each time. Think of good voice-leading practice when applying this principle. The arpeggios by themselves are "correct", in theory, but you don't want to just run arpeggios up and down all the time. This will get boring very quickly. Use them when you hear it in your head and make sure to always resolve accordingly! In this first example, notice that when there's an ascending arpeggio, it resolves to the 3rd of the following chord. This is a great way to really make the chords "pop" and get you sounding like a real jazz improviser. Also, note the use of scalar lines to help connect the chords more effectively. In the second example, we incorporate descending arpeggios to add some variety. Notice that here, the descending arpeggios start from the 5th degree (5-3-1-7) while resolving to the 3rd of the next chord. Yes, this is an embellished version of the following arpeggio (3-5-7-9), but I find that this exercise is a great entry point into extended arpeggios. It's not too technical, and we're beginning with the end in mind. After you've got these down, you can begin improvising even if it's not perfect. The important thing is to make it swing and be "in the moment" before falling back into playing your stock blues licks. Think Kenny Burrell and try to combine your blues vocabulary with more sophisticated jazz lines. For our more advanced readers, you can access a hipper b9 on the F7 by playing a Gb against the chord. So, you know how in a "regular" blues (B.B. King, Buddy Guy, etc.) you mostly see the I, IV, and V chords? Well, that's really the foundation of the blues. In the key of Bb, this would mean that we're sticking with Bb7, Eb7, and F7 for the entire form. In order to lean a little more toward bebop, we'll use just these three chords in the form of scales. This will give you an entry point into playing 8th note lines. You'll be able to access lots of information with only a small bit of information to memorize. Here you have scales to play over Bb7, Eb7 and F7. These scales are known as Bb, Eb and F Mixolydian. The secret here is to make the scales align with the bars with streams of 8th notes. Also, remember to hit that B natural in bar 8 to imply the G7. Even though we're trying to focus on these three scales, implying that G7 is quite effective! And lastly, to finish off this post, we'll go over this great little exercise. Basically, you will go from 1 to 7 (scale degrees) for chords lasting one bar, and ascending and descending for chords that last two or more bars. Make sure you memorize this one! Can you improvise convincingly combining the arpeggios in the previous step (plus resolutions to 3rds) and the scales from this last step? Throw in a little blues lick here and there and BAM! you sound like a proper jazzer! **Note from the editor** This post was updated on 2/6/2019 to improve quality and readability.